You will not talk in vent unless you are an SL, RL or designated by me to be spokesperson of your raid group. You will follow instructions and we are going to have a BLAST. Once the raid was filled out we also created a chat channel for typed instructions as well, Arduinna did a great job riding in the sidecar of Chargul’s motorcycle and translating for the vebral instructions into raid channel text for those not in Vent.Also Chargul was appointed official navigator for most of the run as he knew all the cities pretty well. We organized the groups to have at least one mage for portals, a lock for summoning and a shaman for bloodlust and then headed for our first stop, Stormwind. As we hit the city limits Stormwind I could only imagine what the Alliance must have been thinking with 80ish Syndies ripping the gates off of the hinges and barreling through their streets, horse hooves beating angrily on their cobblestone streets. What they should have been thinking was "thank goodness the other 100 people who were just at the guild picture didn't also come along!" We soon arrived at the chamber of King Wrenn and made pretty short work of him and the small resistance that tried weakly to turn us away. There was NO stopping us though, spells and steel ripped through Stormwind and their king fell before our might. The order was then given to Chargul to take us to the tramway that leads to Ironforge. Small skirmishes took place on the way across to the tramway but the greater majority survived. We regrouped in the tunnel and boarded the tram for Ironforge. At this point I was feeling really good about our team. Although most of our group were in PvE gear some, including myself were decked out in our PvP finery making for a good mix of offense and defense. This was shaping up to be a BAD night to be Alliance. As exited the tram into Ironforge the first thing you see is the gnome “king”. I think he just died of a heart attack honestly. There was very minor resistance in this area. With the gnome down it was on to the dwarf king, Magni Bronzebeard. Now, something that should be noted before we go any further in this recap of our raid on the Alliance and that is, up to this point we have held together as a fairly cohesive group. But, as we arrived at Bronzebeard our group had taken on the “Waffle House” strategy because we got scattered, covered, smothered and chunked. 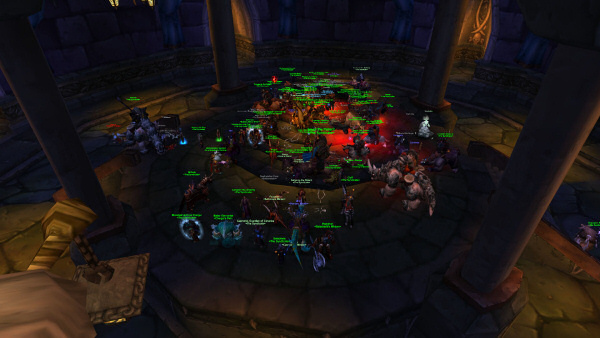 Scattered because some struck out early because they “knew where we were going”, covered and smothered because the Alliance built up a HUGE resistance in the kings room and finally, chunked because of the HUGE lag brought on by 80ish of us and who knows how many of them. We had wiped at Bronzebeard’s room. 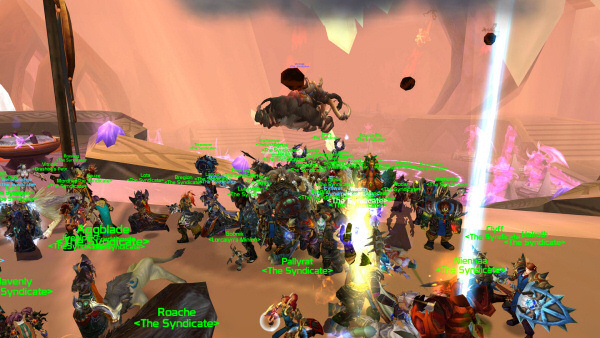 Undaunted, we took the spirit resurrection and began to wait out the 15 minute timer of res sickness. While waiting we were scouted once or twice. An Alliance death knight either stumbled on us or was looking for the group only to find all of us at once turn toward him. The term **** a brick would probably apply well to his situation as he too turned in the direction we were pointed and made for the hills. Now leading a group of this size is no easy task. Getting the marching orders and tactical plans laid out is the easy part. Having those orders and plans executed as you want them is a whole ‘nother barrel of monkeys. But true to Syndicate fashion our group was overall doing a great job and also having a pretty good time to boot. But soon, we would have the two crowning achievements of this raid. 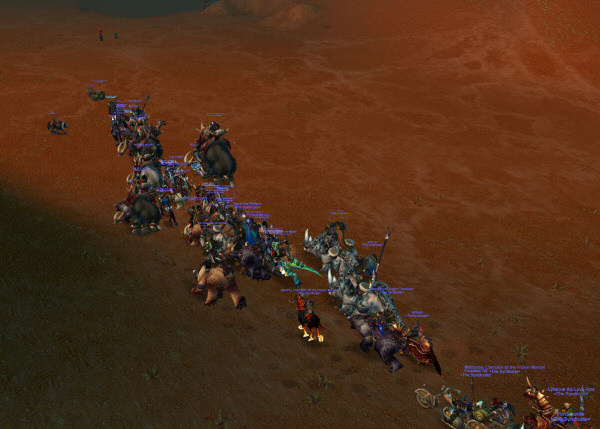 The return march on Ironforge. I reinforced some basic strategies on how we were going to take out Ironforge as we crossed the snowy landscape of Dun Morogh. “As soon as we hit the gates we will all dismount and stick together! PvPers will take the front, rear and sides! Do not stop to fight! Keep moving with the group until we get to the throne room!” And we did just that. I had most of our pvp folks take up defense at the entrance to hold off a counter assault and others to take out any Alliance players already in the room. The tank engaged Bronzebeard and soon he was down. But that wasn’t the best part of Ironforge by far. I had our group head out for the gates of Ironforge again and someone at this point brought up the idea “well their bankers and auctioneers are close!” “Chargul! Lead us to the bank!” I said and off we went. The utter chaos we brought down on the city of Ironforge will be talked about for a long while I believe. Alliance players tried in vain to stop us but we would have none of it. Everything was brought down around their heads with shouts of “LLTS” going up from our groups. Even though they couldn’t read what was said they knew The Syndicate had just paid them a not so social call. In the middle of all this destruction and chaos the bloodlust overtook me and I decided that we needed to go back to and make some adjustments to our previous target. “Back to the tramway! We are going to take out all of Stormwind!” was the next order and we made our way back taking down alliance resistance as we moved as a solid mass of death and destruction. We found after arriving in the tram tunnel that we had lost a couple of folks either to crashes or getting ganked so we stopped there to re-summon folks and regroup. It was here that I was informed that The Undercity was under attack. “Change of plan folks! We are going to defend The Undercity! Mages! 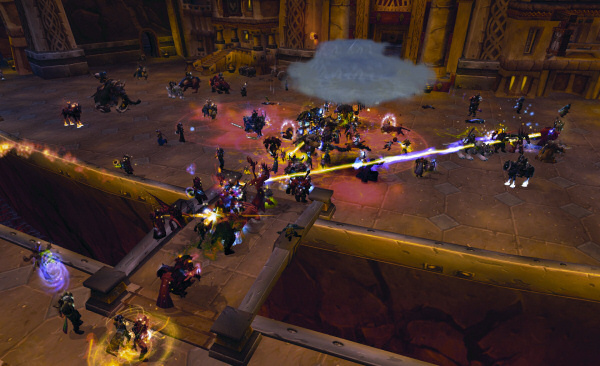 Portals now!” As I was shouting out commands in vent I was also throwing up a portal to The Undercity for our group the other mages followed suit and soon we were mounting up and ready to defend the honor of Our Dark Lady. We quickly made our way to Lady Sylvanas’ chamber. Mass confusion was the order of the day for the Alliance players. They never knew what hit them but they did know it hit them HARD. The Alliance was dispatched in short order followed by more shouts of “LLTS!” by our groups of now battle hardened solders. This was crowning jewel #2 for our group that night. The pride I felt for our guild and its members kept growing by leaps and bounds with each encounter we had throughout the night. Surfing on the high of our last battle I ordered our mages again to cast portals, this time to Orgrimmar and on to the Zoram Strand to regroup and then on to The Exodar and Darnassus. With Brashog helping lead the way we ran full force into The Exodar. There was very little resistance here as it is very much like our Silvermoon city and not many spend a lot of time there. We ripped through the “space goat” city and made our way back to the docks to take down their final city, Darnassus. Either due to the fact that we had the Alliance so confused, demoralized or they had just given up. Darnassus was another walk in the park. In out and done is all I really have to say about the Nightelf city. The raid as a whole was an outstanding victory for The Syndicate. All of the Alliance cities leaders had been taken down. Ironforge, their equivalent of The Undercity had been taken over and ruled by The Syndicate. Lady Sylvanas had been saved from the Alliance attack on UC. Many, many Alliance fell as we swept through their cities. We all had a great time that night because and to me the whole event drove home one simple fact. Long Live The Syndicate my friends.